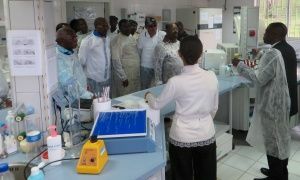 The delegation, headed by the president and vice-president of the National Assembly was given a tour of the tuberculosis lab and the main research laboratory. 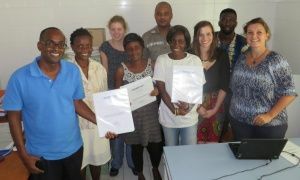 In the context of an EDCTP sponsored lab accreditation initiative of the African Society of Laboratory Medicine (ASLM), the project officer Dr Samba Diallo completed his initial site visit from 16 to 27 June 2014. From 19 -23 May the Hain Line Probe Assay System was installed by a technician from Hain Kenya. Rapid diagnosis of tuberculosis and identification of resistant strains is now possible at CERMEL. The old parasitology building, which mainly performs diagnostics of geo-helminths and Schistosoma has become too small for its growing level of activity. 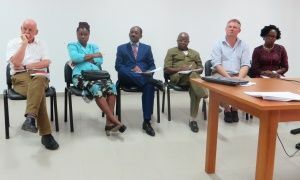 CERMEL held a two day training course on biomedical literature search and reference management, which was organised by Regis Obiang and Bertrand Lell.